Purex has released it’s newest product – Triple Action Formula. It’s available in a fresh mountain scent and a free & clear formula. I was given the opportunity to test drive the fresh mountain scent. I used the product with many loads of laundry. Each load came out clean and was left with a nice scent. The load of whites I used it with proved to do a great job. Often times I have to rewash my son’s clothing protectors as some of them do not come out as clean as I like them to. This load came out clean the first time around. The spaghetti sauce, the chocolate embedded cookie crumbs, the beef stew droppings….it all came out. 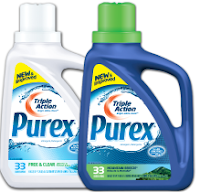 The Triple Action formula can also be purchased in the Ultrapack. Both are safe to use in all types of washers. As always, I love the price, love the scent and the product works.